The recent electoral success of the Freedom Party in Austria, List Pim Fortuyn in the Netherlands, the People's Party in Denmark and the National Front in France have demonstrated the appeal of parties that challenge the political establishment. This book seeks to explain why these parties have achieved a political breakthrough, but unlike other studies in the area does not concentrate on only one type of party. Instead it attempts to determine preconditions for the success of anti-political establishment parties in general, avoiding any time-specific or ideology-specific explanations." "Using variables that could be tested at any point in time, and for any party regardless of its position on the left-right scale, Anti-Political Establishment Parties uses data from nineteen advanced industrial democracies after World War II." "In contrast to prior research, which emphasizes the importance of socio-economic and institutional factors, these findings suggest that parties opposed to the establishment thrive in an environment where official parties are close to each other ideologically, and when weak partisan attachments make voters sympathetic to their appeals." 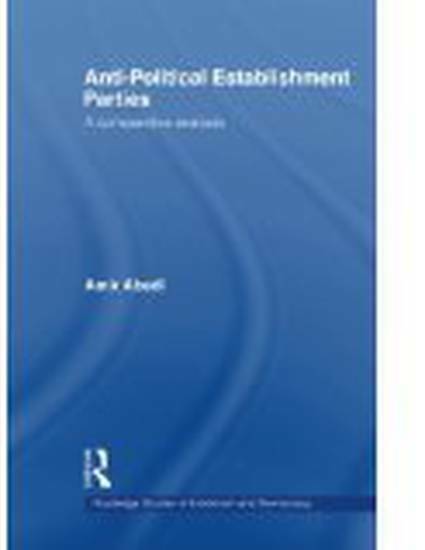 "Drawing on a range of examples from countries across the world, this book provides a detailed comparative analysis of the conditions that encourage and maintain parties which challenge the establishment. It will appeal to students of Political Science and Comparative Politics, as well as those with research interests in political extremism.